WHAT IF A BRIDE NEEDS A MAIL ORDER HUSBAND? Rose is determined her friend Esther won’t be left in the lurch. All she needs to locate Esther’s beloved is an arrest warrant from the North West Mounted. Not exactly mail order, but effective, nonetheless. ˃˃˃ But will Esther’s father greet Gabriel with a shotgun? Rose is relying on the new reverend to keep order and bloodshed down to a minimum. ˃˃˃ WILL TRUE LOVE TRIUMPH? 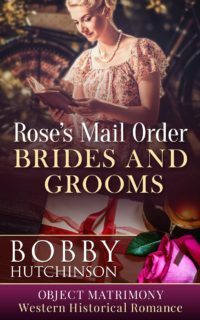 CAN ROSE’S MAIL ORDER MADNESS RESULT IN HAPPILY EVER AFTER?